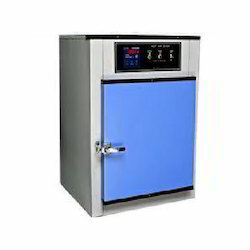 Leading Manufacturer of hot air oven from Faridabad. Food and pharmaceutical industries require maintaining the best hygiene standards and Hot Air Oven provides the dry heat and sterilization. It extracts the excess moisture and inhibits the growth of micro organisms. It is ideal for pasteurization and other food processing. Stainless steel interiors enhance the hygienic condition. The exteriors are powder coated for enhanced handling.